For almost 40 years, field scientists strapped on cross-country skis, shouldered backpacks with supplies and set out over three miles of snow and rocks to a field station near a meadow high in the Rocky Mountains as soon as the snow began melting. Every other day, they counted each flower they found, identified the plant it belonged to and kept meticulous records of their observations. Those observations provide the longest-running scientific study of its kind and tell a story of biological change that teaches scientists new lessons about phenology—the timing of biological events—and how they shift under the influence of climate change. Unlike previous phenological studies that relied mostly on documenting the first appearance of flowers, the new analysis is the first to not only look at when flowers first appear, but also at peak flowering—that is, the time of year when most flowers are blooming—and the last day of flowering in a season. The study was led by Paul CaraDonna, a third-year doctoral student in the Department of Ecology and Evolutionary Biology at the University of Arizona, and Amy Iler, a postdoctoral researcher from the University of Maryland. The results are published this week in the journal Proceedings of the National Academy of Sciences. The paper paints a much more complex picture than previous phenological studies on which ecologists have relied to gather clues about how climate change affects the timing of biological events like flower buds popping, animals emerging from hibernation, leaves turning in the fall or flocks of birds taking off for their seasonal migration. “We already knew that the timing of biological events, such as emergence of the first flowers in a season, has been shifting toward earlier dates, but we show it’s more complicated than that,” said Iler, who is affiliated with the Rocky Mountain Biological Laboratory, where the research was carried out. The study provides data that could inform algorithms used in simulations that model phenological change to help predict what the future might have in store. Analyzing the long-term field records, CaraDonna’s team discovered that over the course of 39 years, the flowering season at the study site has expanded by more than a month, driven by earlier snowmelt and a warming climate. “In a high-mountain ecosystem that is hemmed in by snow for most of the year, a whole month is a big deal,” said CaraDonna, who is a member in the lab of UA Distinguished Professor Judith Bronstein. 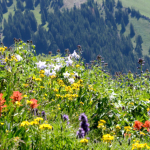 Located at 9,500 feet in Colorado, the study site at the Rocky Mountain Biological Laboratory encompasses meadows with wildflowers, aspen and conifer forests that are covered by a snowpack for the majority of the year. Once the snow melts in mid-May, flowers have only until early October to emerge, bloom, attract pollinators and disperse their seeds before the snow returns. In many cases of recent studies, researchers relied on data sets collected by others instead of spending time actually looking at the plants and animals in nature, CaraDonna said. In addition, the study revealed that the degree to which plants flower at the same time changed over the course of the 39 years, potentially representing a shift in interactions among plants. Phenological changes, the researchers say, can reshape the various aspects of biological systems across the world and potentially even affect agriculture and the global food supply. Exactly how those changes reshape ecosystems will require more research, according to CaraDonna and his collaborators. The paper was co-authored by David W. Inouye of the Rocky Mountain Biological Laboratory and the Department of Biology at the University of Maryland. Visit EcoWatch’s BIODIVERSITY and CLIMATE CHANGE pages for more related news on this topic. Environmental advocacy groups this morning filed suit against the United Bulk coal export terminal in Davant, LA, for violating the federal Clean Water Act. Photographs, video footage and satellite imagery document piles of United Bulk coal and petroleum coke that generate highly polluting dust and debris. The imagery shows plumes of coal-polluted water spreading into the Mississippi River from the United Bulk terminal. The terminal, owned by United Bulk Terminals Davant LLC, has operated for more than four decades, shipping millions of tons of coal and petcoke every year to overseas markets. Gulf Restoration Network, Louisiana Environmental Action Network (LEAN) and Sierra Club filed suit in New Orleans’ U.S. District Court for the Eastern District of Louisiana. The groups, represented by Tulane University’s Environmental Law Clinic, are members of the Clean Gulf Commerce Coalition, which is working to clean-up existing coal terminals in the Gulf Coast region, stop any new coal export terminals, and promote cleaner, safer industries and jobs. Today’s legal challenge follows the suit filed last fall by Clean Gulf Commerce Coalition organization against Louisiana’s Department of Natural Resources for its illegal approval of a coastal use permit for the proposed RAM coal export terminal in Myrtle Grove in Plaquemines Parish. The suit argues that the RAM terminal conflicts with the state’s master plan for restoring Louisiana’s disappearing coastal wetlands. Louisiana is at particular risk from increased coal exports through the Mississippi River. Three terminals along the Lower Mississippi, including United Bulk, are seeking to dramatically expand exports, which would increase the amount of coal and petcoke stored in open piles, blanket nearby areas in dust and discharge more coal-polluted runoff into vital coastal wetlands. The international market for U.S. coal has also grown increasingly volatile. Port authorities on the West Coast and in Corpus Christi, TX have concluded that the coal export market is simply too risky to invest significant sums in new or expanded shipping facilities. Both Clean Gulf Commerce Coalition and the Power Past Coal coalition in the Pacific Northwest are focusing attention on health, safety and environmental impacts of existing coal export systems, including shipping coal by rail from mines to the ports. The Clean Gulf Commerce Coalition includes: Air Alliance Houston, Gulf Restoration Network, Louisiana Environmental Action Network, Lower Mississippi River Keeper, Public Citizen, Sierra Club, Texas Environmental Justice Advocacy Services and Texas Organizing Project. 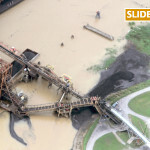 Visit EcoWatch’s COAL page for more related news on this topic. The heads of 16 national and regional climate advocacy groups don’t see how exporting fracked and liquefied natural gas (LNG) fits into a climate change agenda. The group says proposals to expand the country’s fracking exports would undermine President Barack Obama’s efforts to battle climate change. They let him know as much in a jointly signed letter Tuesday afternoon. The leaders, including 350.org co-founder and President Bill McKibben and Waterkeeper Alliance Executive Director Marc Yaggi, want the president to guarantee a thorough, federal environmental impact review for Cove Point, a controversial liquefied natural gas export proposal from Dominion Resources less than 70 miles south of the White House. People participate in the largest environmental protest in Baltimore history, opposing Cove Point, an approved fracked gas export terminal. Sixteen environmental organizations have formally opposed Cove Point in a letter to President Barack Obama. Photo credit: Chesapeake Climate Action Network on Facebook. “President Obama, exporting LNG is simply a bad idea in almost every way. We again implore you to shift course on this disastrous push to frack, liquefy and export this climate-wrecking fossil fuel,” the letter reads. Cove Point has already inspired the largest environmental protest in Baltimore’s history and a few arrests outside a circuit court in Maryland. The group who issued the letter to Obama believes Cove Point represents the “fast-track strategy of the gas industry to export U.S. fracked gas and then ask questions later,” according to the letter. 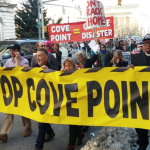 The groups used reports from the International Energy Agency and juxtaposed comments from U.S. Secretary of State John Kerry and Obama against the seemingly contradictory act of moving forward without an EIS on Cove Point. “President Obama has told us many times that failure to address the climate crisis amounts to the betrayal of our children and future generations, so it would be contradictory for the president to allow the LNG export facility at Cove Point to start operating without a full environmental review,” Sierra Club Executive Director Michael Brune said. “We can’t cut climate pollution and simultaneously expand the use of dirty fossil fuels, and we must fully understand the consequences of liquefying fracked natural gas for export. Building new fossil fuel infrastructure keeps America tied to the past. A new report shows that nearly all of the 1.1 million barrels a day of crude oil the proposed Energy East pipeline would carry would be exported unrefined. The report, TransCanada’s Energy East Pipeline: For Export, Not Domestic Gain, shows eastern Canadian refineries would process only a small amount of crude from Energy East, given that they already rely substantially on two other North American sources, with a third source imminent. The report shows refineries located along the Energy East pipeline route can process up to 672,000 barrels of crude a day (combined). Much of that capacity is already being filled by Atlantic crude and U.S. crude, with Line 9 soon to become a third major supply source. TransCanada has proposed export terminals for the port of Gros Cacouna, Quebec and in Saint John, New Brunswick. Another has been suggested by a third party. 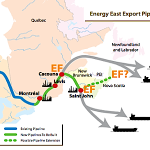 Of these three export points, only Saint John is located near a refinery, underscoring the purpose of Energy East is to export oil, not refine it. Because the largest piece of new pipeline would pass through Quebec, Quebecers would have to bear a lot of risk with little in return. “With the Quebec provincial election underway, we are asking all parties to support the need for an Environmental Impact Assessment as well as participatory hearings on Energy East in Quebec,” said Steven Guilbeault d’Equiterre. This report uses information from TransCanada, along with sources from industry, government reports and legal documents. The groups releasing the report are: Environmental Defence, Equiterre, Council of Canadians and Ecology Action Centre. 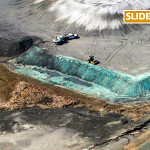 Visit EcoWatch’s TAR SANDS page for more related news on this topic. Waterkeeper Alliance released aerial surveillance photos taken from a fixed-wing aircraft last week showing Duke Energy workers pumping wastewater from two of Duke Energy’s toxic coal ash lagoons into a canal that drains into the Cape Fear River. The revelation comes less than two months after the Dan River disaster, where at least 30,000 tons of coal ash spilled from another of Duke Energy’s toxic coal ash lagoons. The pumping also came just days before a federal grand jury convenes in Raleigh to hear evidence in a criminal investigation of Duke Energy, the North Carolina Dept. of Environment and Natural Resources (DENR) and the handling of coal ash. In these revealing stories in Sunday’s New York Times and Monday’s Los Angeles Times, Duke Energy admitted its workers were pumping coal ash wastewater out of a toxic wastewater pond and into a canal which drains into the Cape Fear River. The Cape Fear River is a source of public drinking water for residents in Fayetteville, Sanford, Dunn, Harnett County, Fort Bragg and Wilmington. Even more startling, Duke Energy described the pumping of coal ash wastewater into a watershed as part of “routine maintenance.” The New York Times quoted Duke Energy spokesman Jeff Brooks as saying: “They’re lowering the water to conduct the maintenance they need to.” According to the New York Times, Duke claims it notified state regulators—a claim that was contradicted by officials with DENR. Duke Energy cannot lawfully discharge any pollutant to a waterway without a proper permit in place. DENR has indicated that Duke did not notify the agency prior to pumping the ponds, and that regulators noticed the pumping during a site visit on an unspecified day last week. “If DENR did not authorize Duke’s pumping, it would show an appalling disregard for the law and the welfare of North Carolinians,” Harrison added. Precisely when did Duke notify DENR that they were going to pump coal ash water into the Cape Fear river watershed? Was it before or after Waterkeeper Alliance photos were provided to state regulators via a news reporter on March 11? Precisely when did DENR discover the pumping activity on a site visit last week? When did it intend to inform the public that a potentially staggering volume of coal ash wastewater had been dumped into the river? DENR should describe exactly what transpired on this alleged site visit when staff discovered the discharges. Has DENR actually issued a permit that allows Duke Energy to pump millions of gallons of concentrated untreated wastewater from two coal ash ponds simultaneously? If so, when was the permit issued? Was it before or after the Dan River spill? Was it before or after the criminal investigation was launched by federal investigators? How much of Duke Energy’s untreated coal ash wastewater entered the Cape Fear River? A “bathtub ring” visible in the aerial photos suggests the wastewater levels in both coal ash ponds had receded several feet by the time the photos were taken on Monday March 10. Given the size of the ponds, that means Duke potentially pumped millions of gallons of highly concentrated, untreated coal ash wastewater from two ponds prior to March 10. Did Duke measure the amount of wastewater pumped from the two coal ash lagoons? Did it test the untreated wastewater for the heavy metals commonly found in coal ash? If so, how much aluminum, arsenic, boron, cadmium, chromium, cobalt, iron, lead, manganese, selenium, thallium and zinc did they dump upstream of the drinking water intakes of Fayetteville, Sanford, Dunn, Harnett County, Fort Bragg and Wilmington? Duke says this pumping was legal and permitted for “routine maintenance” by a permit. Can they provide a copy of the permit highlighting the specific language that allows them to pump millions of gallons of concentrated untreated coal ash wastewater from two coal ash ponds at the same time? Is pumping of coal ash wastewater using portable pumps a “routine?” How many times have they pumped coal ash water into public rivers from portable pumps? Can they provide a list of the locations of their other facilities in North Carolina that have used temporary pumps to dump untreated coal ash wastewater into waters of the state? Did they notify downstream drinking water providers and DENR before they did it? Did they measure the amount of untreated coal ash water they dumped into the public waters? Did they test it for heavy metals before they began pumping? Has Duke Energy ever before publicly acknowledged that they use portable pumps to dump coal ash water into into public waters? Visit EcoWatch’s COAL and WATER pages for more related news on this topic.